We’d love your help. Let us know what’s wrong with this preview of The Pine Barrens by John McPhee. The term refers to the predominant trees in the vast forests that cover the area and to the quality of Most people think of New Jersey as a suburban-industrial corridor that runs between New York and Philadelphia. Yet in the low center of the state is a near wilderness, larger than most national parks, which has been known since the seventeenth century as the Pine Barrens. To ask other readers questions about The Pine Barrens, please sign up. The Pine Barrens take up about one-quarter of the most dense state in the nation. It is my playground. Rich in life, history, and folklore, there is nothing barren about this gem of a place. I've been exploring the Pines more fully for the past dozen years now. McPhee's book has been recommended any number of times. I purchased it several years ago but only picked it up yesterday. Written in 1967, this tells of a different age. Interestingly though, the Pines hadn't changed much over the Fabulous! Written in 1967, this tells of a different age. Interestingly though, the Pines hadn't changed much over the previous 200 years and hasn't changed that much in the nearly 50 years since this was written. I was familiar with most of what was here. Nevertheless, this was a valuable read. Two significant things I picked up from the book was really how short the prosperous times were in the Pines. Once the Revolution was over, the need/desire for the bog iron fell off as better iron and coal were found in western Pennsylvania. Everything after that was trying to hold onto what once was. By 1850, things changed into paper milling and then to cranberries and blueberries. The second significant part of the book was that this was written prior to the Pinelands preservation. That was huge news in my youth. In 1967, it sounded woeful that preservation would be had. I found the jetport proposal to be highly interesting. An airport that would have been thrice as large as Newark, LaGuardia, and JFK combined would have been massive! That was news to this reader. McPhee did well to present the Pines fairly and accurately. We got plenty of the Piney stuff. But McPhee also dispelled much of the nonsense regarding the backwardness that is oft-attributed to the folks who live here. He presented the folklore, but did not dwell upon it. His descriptions matched almost perfectly with the areas of today. I could see Washington, Hog Wallow, Martha, etc. as he described them. Some of the structures are gone and fewer people live in the forests these days, but other than that, yup, the same. The New Jersey Turnpike is not a highway. It’s a sleight of hand, a confidence trick. I drove it for the first time this past summer on a family vacation. In our rented car we entered the Turnpike at the Delaware River near Wilmington and followed it up the length of the state until we passed under the Hudson, by way of the Lincoln Tunnel, into Manhattan. The swindle of the Turnpike is that it leads you through the middle of New Jersey while denying you any evidence that New Jersey exists. You do The New Jersey Turnpike is not a highway. It’s a sleight of hand, a confidence trick. I drove it for the first time this past summer on a family vacation. In our rented car we entered the Turnpike at the Delaware River near Wilmington and followed it up the length of the state until we passed under the Hudson, by way of the Lincoln Tunnel, into Manhattan. The swindle of the Turnpike is that it leads you through the middle of New Jersey while denying you any evidence that New Jersey exists. You do not see it: no towns, no countryside. Trees and shrubs hem you in completely. When you want to stop for gas or lunch, you are channeled into service centers immediately alongside the highway. There are, I think, fewer than a dozen exits in more than one hundred miles of road. The point is to move you as efficiently as possible out of the state. Forbidden any real acquaintance with the place, I drove through the New Jersey of my imagination, humming Bruce Springsteen’s “State Trooper.” Somewhere to the left, in the direction of Philadelphia, one of my ancestors had settled, a yeoman farmer of the colonial period. Somewhere ahead was Princeton, where my brother had attended graduate school twenty years ago. Off to the right for mile after mile, vast and dim in my reverie, were the Pine Barrens. The name sounds like a doom, a place of exile. The Pine Barrens are a broad elevated tract of sparsely settled land, poor in soil, thick with woods, drained by slow molasses-colored rivers with strange names like Batsto and Mullica. In John McPhee’s telling it is a place of social isolation, ghost towns swallowed in undergrowth, dead industries, real-estate bubbles, anomalies of flora and geology, mafia murders, moonshiners, cranberry bogs, and mythological creatures like the Jersey Devil. When McPhee published his book in 1967, a new round of development was planned in the Pine Barrens, including an international air hub and a modern city of a quarter million people. A spur of the Turnpike was proposed that would have cut through the Pine Barrens from approximately Trenton to Atlantic City. Like the grandiose ambitions of planning committees in earlier generations, none of these has materialized, which I find gratifying. Super fun, very quick read. It was written so long ago I wander what's changed about the Pine Barrens since this was first published? Anyways I liked this a lot a lot. What a great book. I enjoyed it much more than, say, Desert Solitaire -- not sure if that's because I am from the area or because McPhee's writing is engaging and the stories are unusual and interesting. Probably a little bit of both. I also love the way this "man out in the wilderness" book subverts the ego. This book is really not at all about McPhee or his experience...he dedicates himself to listening, and I think that technique works much better for the genre than Thoreau-esque self-centere What a great book. I enjoyed it much more than, say, Desert Solitaire -- not sure if that's because I am from the area or because McPhee's writing is engaging and the stories are unusual and interesting. Probably a little bit of both. I also love the way this "man out in the wilderness" book subverts the ego. This book is really not at all about McPhee or his experience...he dedicates himself to listening, and I think that technique works much better for the genre than Thoreau-esque self-centered ravings. The context of the book (published in 1968 or 69), before the Pine Barrens National Reserve in the late 1970s, is a little bit outdated, but it's interesting to see the kinds of ecological concerns for those who lived in the Pine Barrens at that time. Now, the forests are more protected fro industrialization -- although still at risk in new ways. I wonder how influential this book was in raising awareness about the Pines? I visited Batsto recently, and I was really hurt to find that they don't even carry this book in the gift shop. What a shame. -- the first cultivated blueberry bushes were grown in the pines by Elizabeth White in 1916. -- the Pine Barrens are home to an number of unique plant species, including the curly-leaf fern. McPhee's skill at building full, three-dimensional portraits of real people through his careful, matter-of-fact observation of small details is on full display in his characterizations of the various pineys he meets. Highly recommended for anyone interested in the natural and social history of the United States, particularly the mid-Atlantic region, and for all readers who enjoy nonfiction that is as absorbing as a novel. In a state bent on replacing all its mystery with badly-named towns, insolvent megaplexes, and middling upscale restaurants, there's still this huge mysterious swath of woods. Book is non-linear non-fiction, a sequence of organically linked essays that sprawl and cross-pollinate in the manner of forest life. Was written in the 1960s and therefore functions both 1) as a hyper-articulate primer on the value of these woods, and 2) as a time capsule environmental warning about the perils of over-dev In a state bent on replacing all its mystery with badly-named towns, insolvent megaplexes, and middling upscale restaurants, there's still this huge mysterious swath of woods. Book is non-linear non-fiction, a sequence of organically linked essays that sprawl and cross-pollinate in the manner of forest life. Was written in the 1960s and therefore functions both 1) as a hyper-articulate primer on the value of these woods, and 2) as a time capsule environmental warning about the perils of over-development. What's apparent more than 40 years later is that the pines are still mysterious and vast, but development has made it such that one can't be sure reading this whether the places it mentions are still wild, or whether they've become parking lots, exurbs, mini-malls. No total defeat. 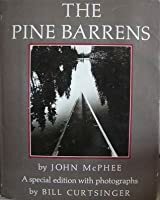 I want McPhee's essays about the pine barrens to be true today. Growing up there, but not necessarily being a piney, I suppose I represent a type of person McPhee could not have been writing about in the 60s. But for a nostos I don't entirely have access to, this book does it for me in every way. & since a you can still get lost, temporarily, in the pine barrens or (like I did) become accidentally submerged in a cranberry bog, his writing is relevant enough. I found this entire book fascinating. Not often am I lured in on this history of my quirky state. So much is to be learned about the Pine Barrens and the people who inhabit it. I am glad I took the time to read this! I have learned so many amazing things! McPhee at his best, and covering the best state. 1960s perspective of the pine barrens and lore. Very interesting. Thanks, Dan - my stop at your new place yielded the best books I've found at a garage sale in quite awhile! The desk at which Jefferson wrote the Declaration. Joseph Wharton’s side project. The Jersey Devil. Mexico’s Charles Lindbergh. Supersonic Airports. Massive forest fires. Moonshine. Catch and release Gray foxes. Real estate bubbles. Gangland murders. Cheeseburgers made from poached deer. Like a few other reviewers, I am a mostly lifelong New Jersey resident who always knew of the Pine Barrens but never really knew anything about the land. This is my first foray into the writing of John McPhee, a The desk at which Jefferson wrote the Declaration. Joseph Wharton’s side project. The Jersey Devil. Mexico’s Charles Lindbergh. Supersonic Airports. Massive forest fires. Moonshine. Catch and release Gray foxes. Real estate bubbles. Gangland murders. Cheeseburgers made from poached deer. Like a few other reviewers, I am a mostly lifelong New Jersey resident who always knew of the Pine Barrens but never really knew anything about the land. This is my first foray into the writing of John McPhee, and I know I am in serious trouble now: I am going to be reading as many of his books as I can moving forward. I've been slowly working my through John McPhee's books ever since reading his wonderful book "Oranges" many, many years ago. I still tell people stuff I learned about citrus fruit since reading that book more than a decade ago, now I can further annoy people with facts about a New Jersey region I'd never heard of before. 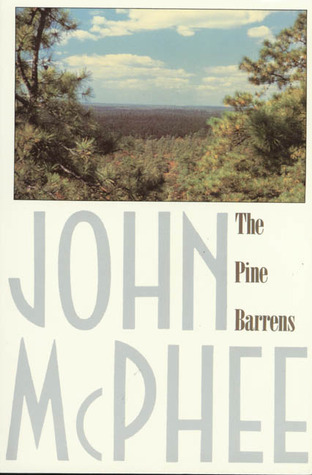 In "The Pine Barrens," McPhee travels around the woodsy area of New Jersey, which apparently has a sort of backwoods reputation, and tells the stories of the interesting charact I've been slowly working my through John McPhee's books ever since reading his wonderful book "Oranges" many, many years ago. I still tell people stuff I learned about citrus fruit since reading that book more than a decade ago, now I can further annoy people with facts about a New Jersey region I'd never heard of before. In "The Pine Barrens," McPhee travels around the woodsy area of New Jersey, which apparently has a sort of backwoods reputation, and tells the stories of the interesting characters he runs into, as well as the region's history. McPhee packs a ton into a slim book--both the history and future of the pine barrens, and the people who live in this forested community. It reads like a long New Yorker piece, full of fun details about a vast stretch of New Jersey woods that McPhee notes has somehow sustained itself as the eastern seaboard grew into a region of cities and suburbs. McPhee details the language and mannerisms of the "piney" people, and I would've liked a wee bit more of that. A fun, informative read though. Bonus p McPhee packs a ton into a slim book--both the history and future of the pine barrens, and the people who live in this forested community. It reads like a long New Yorker piece, full of fun details about a vast stretch of New Jersey woods that McPhee notes has somehow sustained itself as the eastern seaboard grew into a region of cities and suburbs. Driving through the Pine Barrens to the beach for most of my adult life made this title a no brainer. The deft writing, narrative flow, and never-ending supply of scientific, social, and historical fact make this brief text long on edu-tainment value. There are some real characters spread out on those back roads of sand! Published in the late 60's, it's prompted me to read up on current Pine Barrens news and infrastructure. Originally written in 1968 - this slim volume celebrates the vast pine forests of New Jersey. I first encountered these in The Sopranos - when Paulie and Chris drive out there to dispose of a body! McPhee takes us past the stereotypes of the area to meet the people, understand the politics and gain deeper appreciation of fragility of this ecosystem and the wider political landscape. It's a beautiful drawing of the area and has cemented by resolve to return soon. Fabulous! John McPhee illuminates a fascinating and little-known part of the most densely populated state in the way only he can: with insight and curiosity and simple (but flowing and fast-paced prose. Originally published in the 60s, the wealth of information makes me want to explore the Pine Barrens now and see how it has changed. A historical, sociological, and botanical journey into New Jersey’s most overlooked and misunderstood asset...from a 1967 perspective. Great info on the NJ Pine Barrens and it's ecology, and entertaining stories about the people of this historically unknown region. Though the book is outdated, I still recommend reading it if you're interest is in conservation and/or fascinating cultural geography of the past. interesting examination of a strange, somewhat hidden land; the fact that this was written in the '60s adds to its intrigue. I did get bored a few times--some sections were rather dry--but there were enough interesting characters and customs to make it worth finishing. Why did I wait so long to read this book? I have hiked and paddled in the Pine Barrens over the years and never really knew the history. A gem of a book. I would have given it five stars if maps were included.